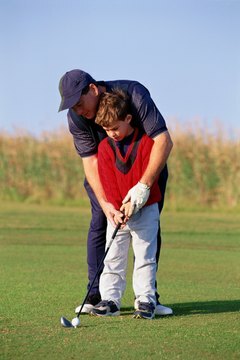 Unlike most team sports, a novice can take up golf at almost any age. Consider taking a beginner group lesson from a pro as a good way to get started. It takes a long time to become proficient at golf, but the rewards are great. Learn the basics from a PGA professional, practice what you learn and then find some golfing buddies and go to the course and play. Ask your pro to make sure your clubs have the features that are designed to help out a beginning golfer. New golfers can start out by taking group lessons at first. Group lessons are less expensive than private lessons, and beginners can learn the basic grip, setup and swing in a group setting. Some people find it comfortable and motivating to learn with others of a similar level. As an added bonus, group lessons can introduce you to other golfers who might become your golfing partners when you are ready to try out your newly learned golf skills on the course. Private lessons give you the individual attention you need once you learn the basics. A small adjustment in the stance, grip or posture can make a big difference in the trajectory of the ball. With one-on-one instruction, the golf pro can focus on changes you need to make to achieve distance and accuracy. One tool used by teaching pros to analyze a new golfer’s swing is videotape. Showing the beginner exactly what he is doing wrong can be an effective method in correcting swing faults. The pro can also offer drills to the student for specific purposes. For example, to encourage a complete shoulder turn, the pro may suggest a drill visualizing a vertical line above the ball. When making the backswing, the golfer can strive to have his left shoulder pass the line to the right, and have his right shoulder pass the line to the left on the downswing and follow through. Golf is a traditional game, and there are many rules a player needs to know to behave correctly on the golf course. Lessons can include the basics rules of golf and golf etiquette. The teaching pro can inform the beginner about such issues as playing the ball where it lies and conditions when it is appropriate to move the ball; keeping up with the pace of play; preventing distractions on the golf course; and golf cart etiquette, including “cart path only” and “90-degree” rules. Often, beginners can borrow clubs from the pro or use demonstration clubs for lessons. When it is time to buy clubs, the pro can make recommendations about the types of clubs to buy and the features to look for. For example, beginners with a slow swing speed can benefit from a flexible shaft, large clubface and higher lofted clubs. The pro might recommend that new players use a 3-wood off the tee instead of a driver, and use higher lofted fairway woods. Pros often suggest using hybrid clubs instead of long irons such as the 3-iron and 4-iron because they are designed to launch the ball easily and allow for distance and accuracy.